Outdoor living in Arizona is a year round event – but for the most part it’s most enjoyable in the mild fall, winter and spring months. Unique’s most popular fireplace (by far! ), has been called the “Cardini Fireplace” by our designers, since this is the project where it was first installed. Arizona is known for its brutal heat in the summer months but many residents choose Arizona for the very mild winters and the pleasant spring and fall seasons. These three seasons offer ample opportunity to enjoy a fire feature during the cool evenings. 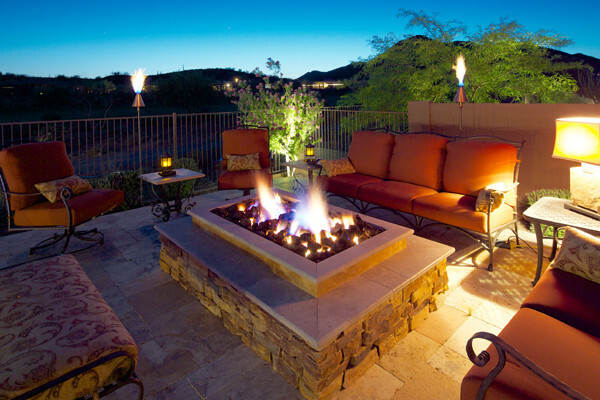 Any homeowner will tell you that a fire pit or fireplace is the most favored feature in their Arizona backyard. It completes the backyard package and is both visually appealing and very functional. 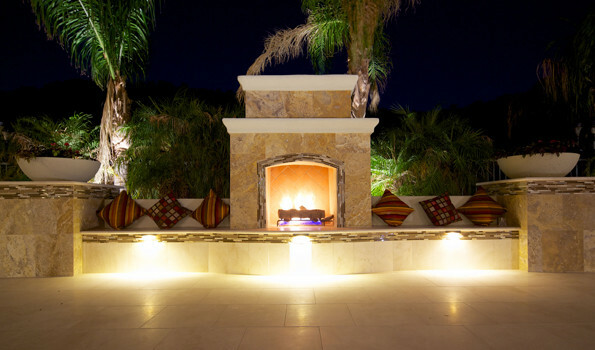 UNIQUE Landscapes has built thousands of fire features including fire pits, fireplaces and other decorative fire features throughout the valley. Each one is custom designed to integrate seamlessly with all of the other features in your outdoor living space. Imagine a few nights a week, sitting outside, looking at this gorgeous Tuscan fireplace with a precast decorative mantle. Fireplaces and fire pits require the coordination of several key elements – masonry, gas and plumbing, and stonework. The masonry work in Arizona is the craftsmanship of the CMU block, mortar and rebar. This is the infrastructure of the fireplace or fire pit. The plumbing and gas line work is completely necessary for a gas fireplace or gas fire pit. This involves running underground gas lines or propane lines from a gas source (usually a propane tank or gas meter), to the fire feature or fireplace. The finishing touches involve stonework, paint and stucco and sometimes tile to match other features in your yard. The reality is that a fire pit or fireplace is not a simple construction project even though some landscape contractors claim it to be. And beyond the skill required to properly construct the project, there is the issue of licensing. Only a general contractor is licensed to install the plumbing and necessary gas or propane needed for the feature to function. This is a fact that most landscape contractors won’t tell you because they are doing the work illegally. However, UNIQUE holds a general contractors license as well as pool and landscape licenses. When you hire UNIQUE to build your fire pit or fireplace you can rest assure that the work is being performed by skilled tradesmen who have years of experience and the licensing required to complete the project safely and legally. WHAT CAN I DO WITH FIRE? This is one of the most common questions usually asked by our clients. And the answer is simple. Just about anything you can imagine we can build. Below is some of the most common terminology used when discussing a fire feature. This can help you to verbalize what you would like to include in your design. A fire pit can be the epicenter of a weekly family marshmallow roasting event. 1. 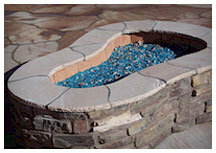 THE FIRE PIT – This is likely to be one of the most common fire features in Arizona. It has become a standard backyard installation due to the ability to fit into almost any yard. Fire pits can range from 3’ wide to as much as 6’ or greater. Normally the wall of the fire pit is built to a height of 12”, but they are all custom-built and the size is up to the owner and landscape designer’s discretion. When deciding to vary from the standard height it is important to remember that 12” has become a loose standard due to its ability to conform to a nice bench seat height. The fire pit can be wood burning or plumbed for natural gas or propane. The plumbing for propane and natural gas are virtually the same but the fire ring or fire logs for each type of gas is slightly different. A wood burning fire pit is a less complicated construction (read in that means cheaper initial investment) and makes for a great evening. But requires the dreaded “clean up” which most homeowners find far less enjoyable. After a few clean outs many homeowners decide that the process is too messy and time consuming so they rarely burn their fire pit. Most clients heed our warning about the clean-up process and opt for the quick and easy gas setup. With a gas fire ring, lava rock is the most common flame distribution method, but UNIQUE has setup everything from silica sand fire pits to glass beads, or even a real-wood looking ceramic log set. Fire pits have become popular because of their ability to be the central entertaining hub for an evening of fun much like a campfire. It is a fun and safe way to add that bit of nostalgia and ambiance to an evening outdoors. 2. THE FIRE POT OR FIRE BOWL – The smaller version of a fire pit is the fire pot or fire bowl. Our clients love the more contained version of putting fire in a presentation pot, and setting it on a stone column as a focal point. Fire bowls create a great overall appearance and can be place in various locations to add impact throughout the yard. They can be filled with lava rock, ceramic logs, or even water. 3. 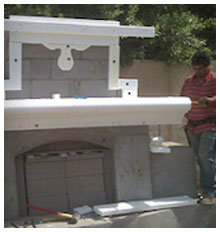 THE FIREPLACE – An Arizona fireplace is the best way to add impact in any backyard landscaping or pool project. This gorgeous focal feature can take on the design and feel of your house, backyard, or patio. 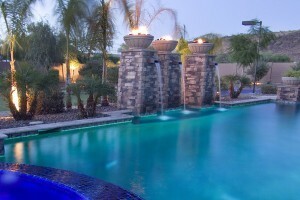 A fireplace in Phoenix is more of a daily focal feature but as the night cools off, it becomes the center of the party. The fireplace is placed on the edge of the patio, whereas the fire pit sits in the center. And even though the fireplace is substantially larger than a fire pit, the fireplace allows for more functional space on the patio due to its strategic location. Traditionally fireplaces are built with CMU block and finished with stucco and paint to match the house. But the UNIQUE design team strives to create UNIQUE design features with stone or tile to include on our custom fireplace designs. The final touch for a custom fireplace the ceramic log set. This completes the authentic look of a real outdoor fireplace and eliminates the messy cleanup! Nothing makes an outdoor fireplace more fun than turning it on and off with the click of a button. And a great added feature is a remote control so that you can light the fire before you even leave the house. 4. THE FIRE CHANNEL – UNIQUE’s ability to design and build custom fire features has always been our forte! Clients love our ability to run fire out 6’ to 12’ in a straight line, creating what we call a “fire channel”. Fire channels create a great atmosphere, as well as an incredible conversation piece. The dancing flames are almost mesmerizing, as the blues and yellows appear in each of our custom fire channels. These features can be used to add a soft light to the edge of a landscape or pool area or to draw the eye to the next feature in your outdoor living space such as the outdoor kitchen or a water feature. 5. THE TIKI TORCH –No backyard oasis is complete without bringing a little taste of the tropics with our fire torches. The DIY versions from a big box store can just be oil-filled and could easily last an entire evening. But the drawback to this version is the danger of an oil filled vessel that could be knocked over and cause serious injury to someone. Our “UNIQUE” version is a custom designed and built tiki-torch with a gas line and copper tiki-torch heads. This version also includes a safety shut-off valve and provides clients with a permanent landscape feature for year round enjoyment of fire! These tiki-torches allow the UNIQUE designers to insert the fire out throughout the backyard and create a complete luau atmosphere. Fire and water collide in this Peoria courtyard water feature. Our clients enjoy the best of both worlds! 6. FIRE & WATER – One of the most challenging fire effects to master is the mixing of fire and water. Nothing beats the visual impact of fire rising from a water feature or water pot. Your eyes see it but your mind does not believe it. After years of studying the pros and cons of fire and water features, UNIQUE has learned how to successfully combine these two elements of nature. The result of this unnatural combination is nothing short of amazing. 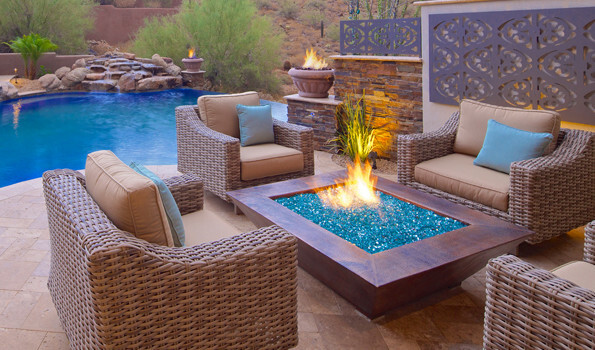 THE BASICS: A standard fire pit in Arizona is a great addition to any backyard. Both a fire pit and a fireplace can be topped with flagstone or stucco. The interior should always contain some type of “fire brick” material and be of sound construction. A fireplace can be the perfect focal point to any backyard and can range from 4’ to 12’ tall. THE UPGRADES: For the truly custom projects, clients tend to prefer the installation of gas or propane lines. This provides an easy means of turning the feature on and off as well as eliminating the messy and time consuming clean-up process. Gas is the perfect fit for any fireplace, fire pit, or fire feature. Safety valves ensure that only adults can manually turn on these fire features and allow for isolation for repairs or when not in use. Custom accents such as stone, Travertine, or boulders can add authenticity to any Arizona fireplace or fire pit. An example of how blue fire glass can accent any custom Phoenix fire pit. THE PREMIUM: For the true fire “enthusiast”, UNIQUE recommends some “premium” upgrades. For any custom project, one fire pit is just not enough! The “enthusiast” can only be happy with MULTIPLE fire features. 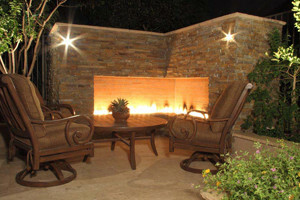 We have completed projects with up to 7 different fire accents in a single backyard! If budget is not an issue, automated fire pits and fire features are the latest advance in outdoor entertainment technology. At a price tag of around $2500 each, clients can enjoy fire at the touch of a button from a state of the art remote control. Fireglass tops off our “premium” list because of it adds a custom upscale look which can be found in both indoor and outdoor fire features. Remember, fire pits can consume a large portion of your usable patio space because they are normally placed in the center of a large area. One solution is to locate the fire pit off to one side of a patio. You might not be able to accommodate as many people around the fire pit but it will allow for more usable space overall. A fireplace should be designed as a focal-point in your Arizona landscape or Arizona patio project. Including features such as a hearth and mantel allow for uses even when it is not lit. Colorful pots of flowers and accent pieces can add seasonal fun and color. Adding cushions or fabric pillows can also turn the hearth into great extra seating. And proper lighting will make you fireplace a beautiful focal point every night. Virtually anything can be done with fire. 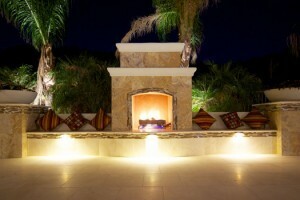 Let the UNIQUE design team create a custom fire feature to add interest and ambiance to your outdoor living space. All of our fireplaces and fire pits start with a solid concrete footer with a ½” rebar grid. This creates a solid foundation on which to build the structure. Next, the block base is built by our skilled masons. Finally, the entire structure is filled with rebar and solid grout to secure the corners and top block (bond beam) creating the best possible base. Throughout the build process UNIQUE focuses on maintaining drainage patterns and water flow away from structures and your home. The base is typically coated with a stucco texture to match or complement the house. Upgraded designs can include a variety of additional finished such as veneer stone or tile. Our standard fireplaces can be enhanced with real stone mantel, travertine tile accents, or just decorative stucco. An example of some of the professional installation methods we use when building some of our custom fireplaces and fire pits. • Bond beams, rebar, and solid filled block -Sadly it is considered an industry standard to just stack block and stucco it in place. But the UNIQUE mason’s mortar every block and then take an additional step to increase stability. They fill the interior of all of the blocks it with rebar and concrete. This adds to the integrity of the feature and eliminates the potential for cracks. • Stone and Tile Experts –UNIQUE projects look better when they are completed because of the experience and attention to detail that the UNIQUE stone and tile experts add to each project. This team builds so many fireplaces and fire pits each year that we keep full-time tile setters, flagstone masons and stone experts on each of our projects. These are craftsmen who actually specialize in their “UNIQUE” skill and are some of the very best in the valley! • Unique Designs – UNIQUE specializes in some of the most detailed and intricate water and fire features that Phoenix has to offer. Chris Griffins background in engineering allows UNIQUE to research, engineer, design and perfect any custom fire feature or any specialty project that our clients can imagine. From automated fire and water, electronic ignition, water and fire combined, we have the experience and the skill to build it. There is no reason for you to be another contractors “experiment”! 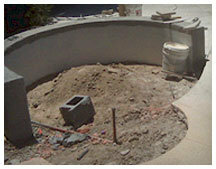 An example of a fire pit in the rough stages, one can clearly see the gas line integration early in the construction process. • Gas and Electric – As licensed pool and general contractors, we are one of the only landscape companies that can “legally” and safely perform these services for our clients. Don’t risk your home and your family’s safety by letting an unlicensed landscape contractor work with something as potentially volatile as gas, propane, or electric on your property! • Safety – Nothing is more important than the safety of your family and your home. UNIQUE makes sure that everything we do is designed and built for a lifetime of safety. From our “child-proof” key valves, to our safety shut-offs, our fire features are as safe as they can possibly be when they are not being used.